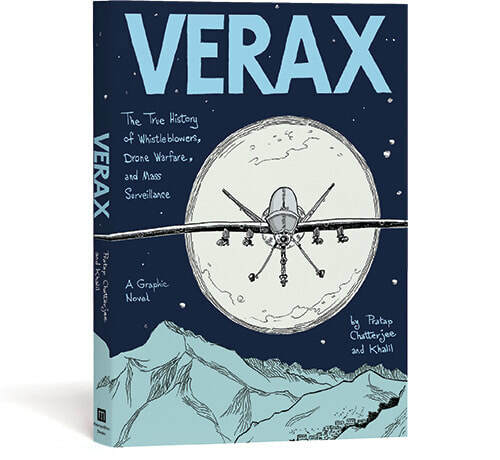 Verax: The True History of Whistleblowers, Drone Warfare, and Mass Surveillance: From a prize-winning journalist and the co-author of the best-selling Zahra’s Paradise, a sweeping graphic history of electronic surveillance from 9/11 to the latest drone strike. 9/11 not only marked the worst domestic terror attack in U.S. history, but also unleashed electronic spying by the government on a massive worldwide scale. In a wholly original and engaging telling, Verax (“truth-teller” and one of Edward Snowden’s code names) recounts the full story of American electronic surveillance post 9/11, in brilliant comics form. We follow Pratap Chatterjee, journalist sleuth, as he dives deep into the world of electronic surveillance and introduces its cast of characters: developers, companies, users, government agencies, whistleblowers, journalists, and, in a leading role, the devices themselves. By condensing a crucial event of the 21st century and a broad, complex history into a compact, engaging, and vivid work, Verax is a significant contribution that is certain to last.